This blog has discussed Intoxilyzer 8000 litigation in many previous posts. One of those posts (November 18, 2012) mentioned the case of State v. Lancaster in the Marietta Municipal Court. I was asked to help with that litigation as counsel for Lancaster. Like many of the I-8000 cases throughout Ohio, the Lancaster case involves the reliability of the I-8000. Unlike most of the other cases, however, the Lancaster case includes testimony of expert witnesses for the prosecution and defense. After five days of testimony, the verdict is in, and the breath test is out! The decision has already been appealed and is staged to possibly change the interpretation of breath-testing law in Ohio. In 2009, the Ohio Department of Health (ODH) purchased about 700 Intoxilyzer 8000s for a cost of approximately $6.5 million. The transaction was facilitated by the head of the ODH Bureau of Alcohol and Drug Testing, Dean Ward. Soon thereafter, Ward began working for the I-8000 manufacturer, C.M.I. Use of the machines began in 2010 and gradually increased. As law enforcement increasingly used the machines, defense attorneys increasingly challenged their reliability. In State v. Gerome, an Athens County judge heard expert testimony and found the I-8000 is prone to errors. The judge concluded that evidence from the I-8000 is admissible, but defendants may challenge the test results based on circumstances that may make the results inaccurate. Courts throughout Ohio have ruled that I-8000 test results are not admissible, but most of those rulings have been overturned on appeal. For example, in State v. Reid, a Circleville judge excluded evidence from the I-8000 because the prosecution did not demonstrate that the I-8000 is accurate and reliable. Reid was overturned by the Fourth District Court of Appeals, which reasoned that State v. Vega prohibits a general attack on the reliability of breath testing instruments, including the I-8000. About 15 defendants in the Marietta Municipal Court filed motions to suppress evidence based on the I-8000’s lack of reliability, and the Court consolidated the cases for a hearing. The prosecuting attorney arranged for the testimony of expert witnesses, and local counsel sought the assistance of the DUI Committee for the Ohio Association of Criminal Defense Lawyers (OACDL). I, along with committee member Tim Huey, became involved in the litigation as counsel for defendant Chelsea Lancaster. It was anticipated there would be testimony from three expert witnesses, and the hearing would be concluded in one or two days. By the time we were done, there was testimony from six expert witnesses, and the hearing lasted for five days. The prosecution introduced the testimony of Brian Faulkner (the head engineer for the I-8000 manufacturer), John Wyman (a forensic toxicologist), and Mary Martin (then administrator of the ODH Alcohol and Drug Testing Program). The defense introduced the testimony of Thomas Workman (an expert in electrical engineering and computer science), Alfred Staubus (a forensic toxicologist), and Michael Hlastala (an expert in physiology). Just before we delivered closing arguments, the appellate decision in Reid was released by the Fourth District Court of Appeals, and Marietta is in the Fourth District. The Court distinguished this case from Reid (and most other cases) by presuming the I-8000 is reliable and placing the burden on the defense to prove it is not reliable. The Court found that the defense proved the I-8000 is unreliable due to several problems, including radio frequency interference, interfering substances, mouth alcohol contamination, and potential operator manipulation. In the written decision, the court referenced the misinterpretation of the rule in State v. Vega and established a clearer interpretation of Vega that permits defense attacks on the reliability of testing equipment and procedures. The prosecution has already appealed the trial court’s decision to the Fourth District Court of Appeals. The Fourth District said in Reid that it welcomes “further review of this issue so as to end the uncertainty percolating in the lower courts regarding Intoxilyzer 8000 reliability and test result admissibility.” The Court also commented that, “We recognize that the Ohio Supreme Court may decide to reconsider Vega in light of subsequent changes in the legal landscape”. This may be the case in which that happens. It turned out the prosecutor missed the deadline for filing the Notice Of Appeal, so the Court of Appeals never heard the case. 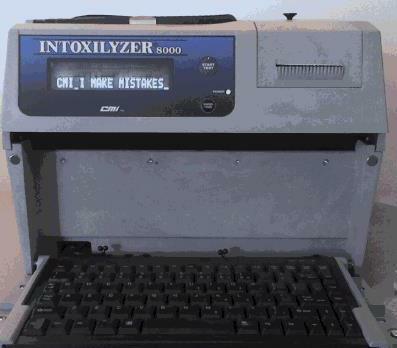 A subsequent Intoxilyzer 800 case, however, went to the Ohio Supreme Court, and the Court used the opportunity to reiterate the true interpretation of the Vega case: the defendant has a right to challenge the accuracy of the defendant’s breath test result. That case, Cincinnati v. Ilg, is the topic of an article in this blog on October 5, 2014 (http://bit.ly/1uNSGsD).